Most people can agree that a thru-hike is an adventure to remember. Even though it’s just walking through the woods everyday, it is a transformative experience very unlike the day-to-day of “normal” life. Along with all the other preparations for our hike, Limbo and I spent some time trying to think about how we might want to document our hike, and what information was important for us to remember. We were lucky enough to win a GoPro in a raffle prior to the hike, so that made our photography decision easy. I knew from the start that I wanted to keep a trail journal. But that wasn’t enough; we wanted to be able to look back on our hike with insight. Why did we spend the money we spent? Were we really hiking as many miles as it felt like we were? Was there a correlation between the miles we hiked and how much we ate? My educational background is engineering. Although I don’t see myself as a stereotypical engineer, I do love data. I love collecting data, analyzing data, finding correlations…you get the point. I also have a terrible memory. My solution to those two attributes of myself is to record everything, and our thru-hike ended up being no exception. A detailed trail journal. Each entry included our starting and ending mileage for the day, the name of the shelter or campsite if we weren’t stealth camping, any towns we stopped in, and other interesting happenings for the day. The entries started short, but grew as I realized how much I wanted to remember every detail: all the difficult climbs, beautiful views, the people we met along the way. I chose to keep the journal electronically using an app on my phone (ColorNote). This way, I could backup the journals to Google Drive or email them to myself and easily look details up later. A spreadsheet with mileage data. Whenever we were in town or had wifi, I would take the time to transfer the mileage from my trail journal to a Google spreadsheet. The spreadsheet had the date, number of days on the trail, how many miles we hiked for each day, a running total of miles hiked and percent of trail complete, and a running average of our miles per day. Once the backbone of this document was complete, it was very easy to update. I could even update it on the trail, if I had cell service! A spreadsheet with budget data. As a separate tab on the document described above, I kept track of every. single. expense. on the trail. This one is the one I had the most trouble keeping updated, and would try to find a better system for next time. There’s a lot to say here. Limbo and I each carried one unique credit card with us (which we paid off every month). One was an REI Mastercard, the other Discover. Our goal was to only use the Discover card. 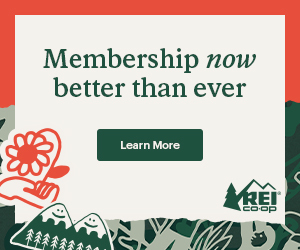 We’ve found their customer service to be excellent, and it’s an easy one to use for cashback at grocery stores. Limbo also carried a debit card, only be used if an ATM was necessary. Some lessons learned: A surprising amount of businesses don’t take Discover. Many places still prefer or only accept cash. If I have cash, it somehow instantly disappears and I can never remember everything I spent it on. My goal was to fill in our expenses in every town right before leaving so that we would generally be up to date. As you can imagine, that’s easier said than done. What ended up happening was a lot of catching up in libraries, more like once or twice a month. That meant logging in to multiple online accounts to paste information in to my spreadsheet. I would not recommend this. It isn’t fun. What I would do differently: First of all, I wouldn’t take a credit card at all. It’s nice to get the reward points, but remembering to pay off the balance every month for two different cards was pretty annoying. I think most people just had a debit card, and that’s what I would do next time. I might also try to use an app like Mint that does some of the analysis work for you. Other – one-off expenses like permits for the Smokies, sending mail, and medical care. I would have made medical care a separate category, but thankfully we only had to seek medical attention once throughout the entire journey. We are so lucky! So…what’s the point of all that? I would like to be able to say that I immediately dove into the data we collected on the trail and have a perfect analysis to share. The truth is, I am just now getting all the information put together in a coherent form. Mostly, this means combining everything into one spreadsheet and looking for fun ways to interpret the data. 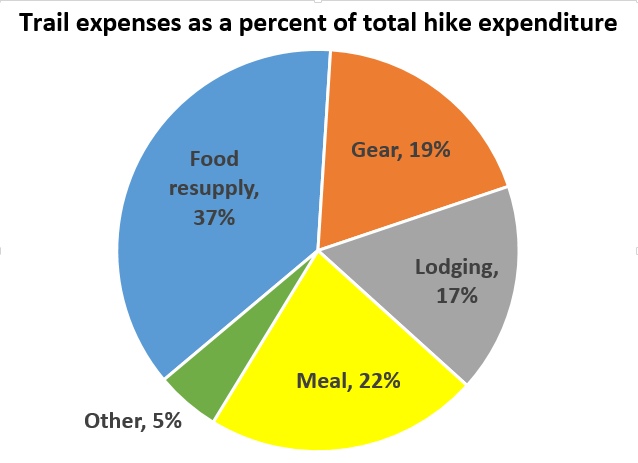 To start, here’s a pie chart showing our expenditures as a percent of the total, based on the categories above. As you can see, food was by far the biggest expense. This is a very visual representation of the hiker lifestyle- eat as much as possible, whenever possible. Our gear purchases on-trail were much higher than we expected, but a big part of that was the early failure of our sleeping pads and buying summer bags while on trail. Despite my best attempts to keep up with tracking all the information described above, at the end of the day my top priority was to actually enjoy the walk. If I was lazy or distracted, working on a spreadsheet clearly wasn’t in the forefront of my mind. However, I am glad I put effort into tracking this data. I would definitely recommend that future hikers think about what they might be interested in tracking during their hike. It was nice to see our mileage growing in a very tangible way when I opened the spreadsheet, and keeping track of expenses kept us from totally overspending. I’ll also say that Awol’s AT Guide is an exceptional resource that can aid in remembering specific mileages, landmarks, etc. I plan to share some detailed insights as I finish up my analysis; stay tuned! Very nice; looking forward to the update once it’s all sorted. And of course wondering what a thru-hike is going to cost me. Would you be willing to post a link to your spreadsheets, with your data? Or without? I would like to get an idea of the thru hike cost. Hi Paul, thanks for your comment. Every hike is different, so I’m hesitant to post our hard numbers. I can tell you that for us, it ended up being about $26/day if you were to take a straight average. Much more than we anticipated! Hi, I am Recreation Management student at Appalachian State University. I am currently working on a research study with the head of my department about the economic impact of the Appalachian Trail. If it is at all possible, I would love to be able to see the hard numbers, or just the total for each trail town it would be super helpful. I would also love to hear from anyone else that has a spreadsheet of what they spent and where! Thanks!! Hi Stella, Thanks for reaching out. I just sent an email to the address you provided with your comment. Let me know if you have any questions! Very informative! Thanks for the data. Would you by chance have a $$ amount to show as well alongside the pie chart? I’m also trying to get hard numbers for trail prep. Hi Christina, thanks for your comment. Every hike is different, so I’m hesitant to post our hard numbers. I can tell you that for us, it ended up being about $26/day if you were to take a straight average. Much more than we anticipated! I need some part two in my life pronto. Data: When my son hiked the PCT, he used a Spot. I followed along every day , logging his Spot’s coordinates, i.e. lat. and longitude, with the help of Google maps on the internet, the distance he hiked. the duration and also the elevations. I also purchased all the NFS PCT maps and put a mark at each approximate coordinate where he was at the end of the day and where he camped. Very helpful to know his locations in case of emergencies. A wonderful way to pass the time ans kept me busy for 5 months!